The New Comprehensive and Progressive Trans-Pacific Partnership (CPTPP) - How Different From the Other? The New Comprehensive and Progressive Trans-Pacific Partnership (CPTPP) – How Different From the Other? 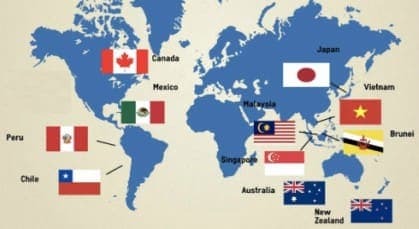 The final text of the Comprehensive and Progressive Trans-Pacific Partnership (CPTPP) Agreement, to be signed on 8 March in Santiago, has now been released. The key substantive provision incorporates the original TPP text into the new Agreement. The remainder of the Agreement consists of mechanical provisions that establish how the Agreement operates, and an Annex containing certain provisions of the original Agreement that are suspended. >>authentic texts: there are English, French and Spanish versions of the text but if there were is any divergence between the texts the English will prevail. Transparency: the provision in the Annex to the Transparency chapter that sets out certain “procedural fairness” obligations that would have applied to PHARMAC’s operations. These and the other suspended provisions can be brought back to life only if all 11 CPTPP partners agree. In practice this creates a potential bargaining chip should the US want to join the Agreement in the future and have the suspensions removed. In this situation, the existing partners could seek to extract further market access concessions from the US as part of accession negotiations. We have yet to see the side letters that will likely be concluded before signature. These are country-to-country agreements that affect how treaty obligations will apply as between them. It remains to be seen whether New Zealand will be successful in excluding application of the investor state dispute settlement provisions with any countries other than Australia. If it has, we could expect to see this done through side letters. We can also expect to see side letters dealing with Canadian concerns over its cultural industries. Malaysia’s concerns regarding its state-owned-enterprises obligations, and Brunei’s over its services and investment obligations in the coal sector, have been addressed by tweaking the rules around when those particular obligations will take effect. The New Zealand National Interest Analysis (NIA) that accompanies the text emphasises that the relative importance of CPTPP has increased because of threats to the effective operation of World Trade Organisation (WTO) rules, including its dispute resolution mechanism. While the US is no longer part of the Agreement, the NIA argues that there are still significant economic benefits to be had. It notes in particular, gains to be had from having, for the first time, preferential market access into Japan (the world’s third-largest economy), Canada, Mexico and Peru. Reviving the TPP is a significant achievement and we congratulate the New Zealand negotiating team on this outcome. In addition to the new markets being opened up, many of our primary sector exporters will now attain an equal competitive footing with their Australian counterparts who have been benefiting from that country’s bilateral FTA with Japan. We can also expect further countries to seek accession to CPTPP, further increasing our export benefit. New Zealand exporters should be planning now for implementation of CPTPP by assessing their current and potential markets and seeing how their supply chains can be optimised to make the most of the opportunities afforded by preferential market access. They should also ensure they understand the rules in the Agreement that affect their business so that they can engage with government over the coming years to ensure full and proper application of those rules by our trading partners.